We want to take a few moments to wish all our lovely followers, friends and customers a most joyful, prosperous and blessed New Year! We look forward to serving you in the coming year with more of the great soaps and body products you’ve come to love, and maybe surprise you with some new treats throughout the year. Warm wishes and much love from all of us here at Sara’s Soaps ‘n Such! Posted on December 29, 2013 Categories Vintage Sara's Soaps 'n SuchLeave a comment on Happy New Year! It’s a mess. A colorful, jumbled mess. It looks impossible, useless and worthless, but it’s not. 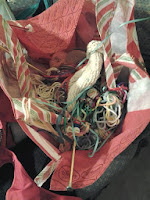 Well, right now it is, but just like any bag of yarn post-cat attack, my thoughts just need some patience and time for me to sort them out, strand by strand, color by color, fiber by fiber. Business is slow this holiday season, and I know it’s not just mine. My shows had lower results than in previous years. My Black Friday through Cyber Monday sales were slower. No, I’m not whining; it is what it is. Black Friday sales nationwide in all retail markets were lower this year. Colleagues are reporting lower sales in all markets, and I’m both seeing and hearing how small, independent businesses are struggling right now. Knowing how much my family depends on my income, the economic slow-down is rather frustrating and discouraging. After talking to a small business owner of whom I think highly this past Saturday and hearing her story, I thought, There’s a reason it’s called an economic depression. Early Friday morning, my paternal grandpa died. He was very old and had lived a rich, blessed life, ended by a good death with his wife of 67 years by his side. It’s still hard to believe that I won’t see him at Christmas. The travel home for the memorial service was a necessity, though I had work waiting for me when I came home. My mind kept spinning with that incessant question many people face this time of year: “How are we going to afford presents for everyone?” Then some quiet time with my youngest daughter brought the answer to me: We focus on Jesus as the real reason behind the season, and the rest will fall into place. Now I’m not dreading buying gifts; I’m anticipating with excitement the celebrations and seeing my family. Financial realities mean I won’t be able to afford to buy gifts for some very dear people in my circle. In fact, my bestie and I agreed just to give each other cards, because I’m a total card person. I had been dreading that conversation, but he and I are on the same page, so it’s all good. Time is getting away from me to get presents made. There are lessons to teach, a business to run, decorations to put out and a home to make company-ready. Juggling all this stuff is hard, but my re-reading of Boundaries by Cloud and Townsend has shown me that I need to put boundaries on my own time, budgeting my 24 hours wisely each day. If you’ve gotten this far in this article, thanks for hanging in there with me as I’ve attempted to untangle my internal yarn barf. Support your local small business. All of us small businesses rely on loyal customers to help us support our families and our local communities.